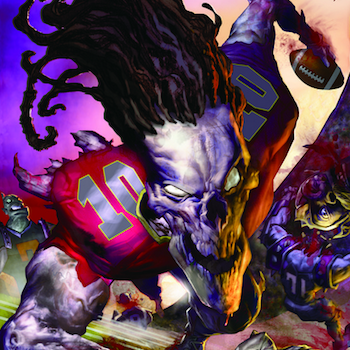 Mutant Football League is gearing up for a rematch on Kickstarter after its first campaign's failure. As a modern revival of an oldschool classic, Mutant League Football was all set to capitalize on the nostalgia-to-money converter that is Kickstarter. However, it didn't quite go according to plan: the project asked for $750 thousand, and only received about $140 thousand in pledges. But scoring less than twenty percent of the target isn't stopping project lead Michael Mendheim from trying again, with a few big changes in scope and focus. He's pretty sure he knows what caused the first failure: a misguided focus on going mobile. Last year's Kickstarter campaign for Mutant League Football was ambitious, to say the least. The original design aimed for a multi-platform release from mobile devices to living room consoles, but a few Kickstarter veterans convinced Mendheim to try focusing on mobile platforms. He did so, and the results were less than spectacular. "So I led my Kickstarter campaign with mobile," Mendheim explains, "and the backlash to that was just unbelievable. We were sunk that first day." Mendheim is now returning to the field with ambitions tempered and lessons learned. A new crowdfunding campaign for Mutant League Football is coming up, but this time the funding target will be lower. Most critically, mobile development isn't even on the table - the game will be developed for PC first and foremost, with more platforms coming later. Only time will tell if these changes will put Mutant League Football back in the game, or if it's doomed to stay on the sidelines.